The people behind OKCupid are all mathematicians by training, so I’d be surprised if they hadn’t taken the underlying age distribution into consideration. But they don’t say anything about it in their post. The worry is that, if the base rate of different age groups isn’t taken into consideration, the heat map displayed above could be quite misleading. Given that there are many, many more 25-year old women on OKCupid than 35-year old women, failing to normalize properly would almost invariably make it look like there’s a heavy skew for men to message relatively younger women, irrespective of the male sender’s age. 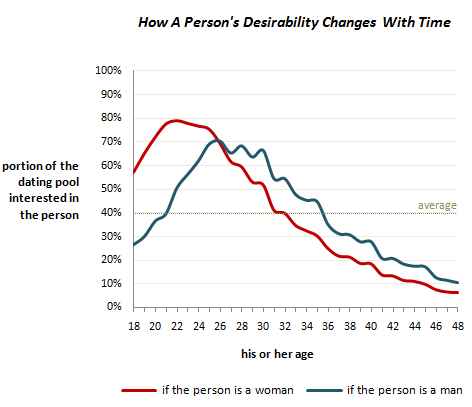 By the same token, it’s not clear that it’d be good advice to tell men to seek out older women, given that there are many fewer older women in the pool to begin with. As a thought experiment, suppose that the entire OKCupid male population suddenly started messaging women 5 years older than them, and entirely ignored their usual younger targets. The hit rate wouldn’t go up; it would probably actually fall precipitously, since there wouldn’t be enough older women to keep all the younger men entertained (at least, I certainly hope there wouldn’t). 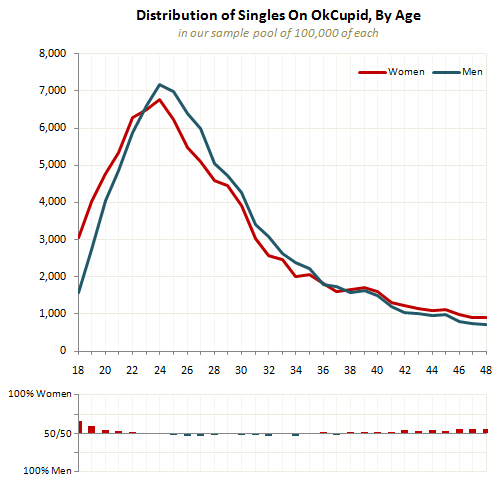 No doubt there’s a stable equilibrium point somewhere, where men and women are each targeting exactly the right age range to maximize their respective chances. 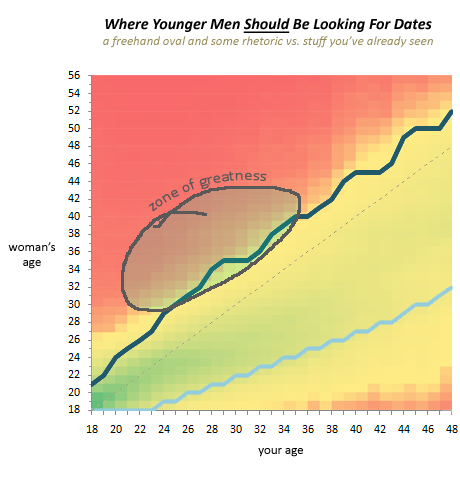 I’m just not sure that it’s in OKCupid’s proposed “zone of greatness” for the men. 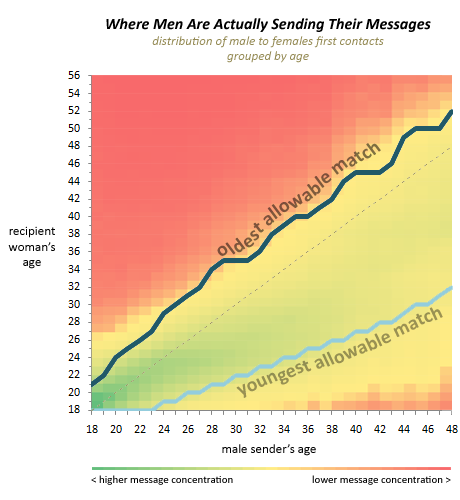 It’s also a bit surprising that OKCupid didn’t break down the response rate to people of the opposite gender as a function of the sender and receiver’s age. 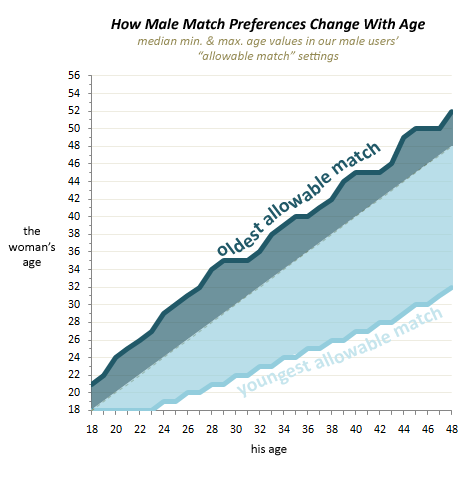 They’ve done this in the past, and it seems like the most direct way of testing whether men are more likely to get lucky by messaging older or younger women. Without knowing whether older women are actually responding to younger men’s overtures, it’s kind of hard to say what it all means. Except that I’d still kill to have their data. While there is plenty of interesting material mentioned, it may not be entirely accurate. For example, many women in their thirties and forties use online dating services for their true love. Many mature women are coming out of long term relationships and the dating world has changed since they first started dating. Additionally, many women have careers that give them little time to find potential men to date. Does it mean that a woman going to a bar who is mature more monogamous than someone who uses online dating? I suppose the question of whether the results are selection effects rather than a real age difference is academic if you’re an OKCupid user, because if something is true of other OKCupid users, it’s not your concern whether or not it’s also true of random people. The point about the base rates of users at different ages is a good one, though. It’s hard to tell from the graph… the heat map must be normalized for male age because otherwise it would be all red over to the right (because there are few men of that age). Next Next post: what do personality psychology and social psychology actually have in common?